Ah, so it's the issue with ships given move orders dedicating all of their attention to thrusting in the desired direction, even when at max speed? Assuming the ship's going to work like all of the other freighters we've seen, why not try to 'solve' the issue the same way George did for the smartcannon - armed outlaw freighters? It's functionally the same problem, though the AI doesn't really understand how tracking works, which exacerbates the issue for the T31. JohnBWatson wrote: Ah, so it's the issue with ships given move orders dedicating all of their attention to thrusting in the desired direction, even when at max speed? Assuming the ship's going to work like all of the other freighters we've seen, why not try to 'solve' the issue the same way George did for the smartcannon - armed outlaw freighters? It's functionally the same problem, though the AI doesn't really understand how tracking works, which exacerbates the issue for the T31. I'm giving the Honuko-Tomashi ships an energy-weapons focus, so tracking is kinda out sadly. I may just limit the Nakamoto to the trader encounters where the other bugs might hopefully cancel out this one. Shrike wrote: I'm giving the Honuko-Tomashi ships an energy-weapons focus, so tracking is kinda out sadly. That's not quite what I meant - the swivel-mounted energy weapon you're using is functionally identical to the tracking Smartcannon in this problem, but may work a little better due to the fact that the AI will use it on anything within its swivel area, whereas tracking weapons aren't used on everything they can hit. George handles the T31 being unable to rotate in response to threats by giving it some escorts to cover its blind spots. I may just limit the Nakamoto to the trader encounters where the other bugs might hopefully cancel out this one. I'm confused - isn't the issue we're talking about exclusive to trader encounters? Where else would a superfreighter show up? There's a large scrub fire near my home as of right now. It doesn't appear to be a threat now and I'm in no personal danger. However if the wind changes I may need to evacuate. In that case, development will be on hold until further notice as this house is surrounded by burnable trees and stuff. I will edit this post when the situation is resolved. So the fire went out, I went back to uni, released a patch, and got a new doctor who might be able to hook me up with some hormones. In actual modding news, I've been doing some mockups to eventually throw at Xephyr. I've got a decent enough style going for Honuko-Tomashi right now...the trick will be diversifying it for other manufacturers. In the longer term I have to get AXTIR, Voss und Szell and Archimedes Industrial all with their own ships and visual style. Due to running into a serious engine bug, I've started work to swap over to a more modern filestructure. This will, unfortunately, break compatibility. So I'll take the opportunity to rename the mod and start working on adding some extra systems and the like into the mix. ETA is "eventually". Fixed a problem that was causing the crash (it was a typo that was throwing an error several thousand lines later). Today I made a gun to replace the thermo cannons on the gaian processors. It looks good, fires good, sounds great with SNAPSS and performed as expected once I altered the processor. Unfortunately I now have to completely redo it due to an engine issue I've been asking to have fixed for about...ooh....several years. Namely, ammunition doesn't handle repeats. So I'll have to make a brand new ammunition item to get around it. This well-guarded station will sell and install Bushido stuff. As you might reasonably expect. In the long run, they'll also do Honuko-Tomashi but I'm a bit iffy on my code for that right now so I'm playing it safe. They have a custom version of the Hanzo as a defensive gun, and four turrets with katanas mounted. ....Do not sit next to one of these stations while it is firing. It's like the Rasiermesser factory. You will die. I gave them a basic gun derived from the Shuriken. it's designed for auton and low-power use. I also added the aforementioned hanzo defense gun, and redid the effects on the Hanzo. These are ported directly from SM&M+ and will need an update to get the colours right (they're the wrong green right now). Also, even though they're not that effective against level-appropriate armor...they will still kill players perfectly well. So my next set of features has run headlong into the "George never finishes his systems" problems. So until the enhancement device system is finished and basic ammo functionality is extended, all that stuff can't really be completed. I did get a quadruple version of the Theseus coded though, as well as two out of the three planned weapon enhancers for Archimedes (the third isn't possible, and none of my planned shield boosters are possible yet either). Replacing the "Scout's Wolfen", the Scorpion is a fast-ish ship with reasonable armor limits. 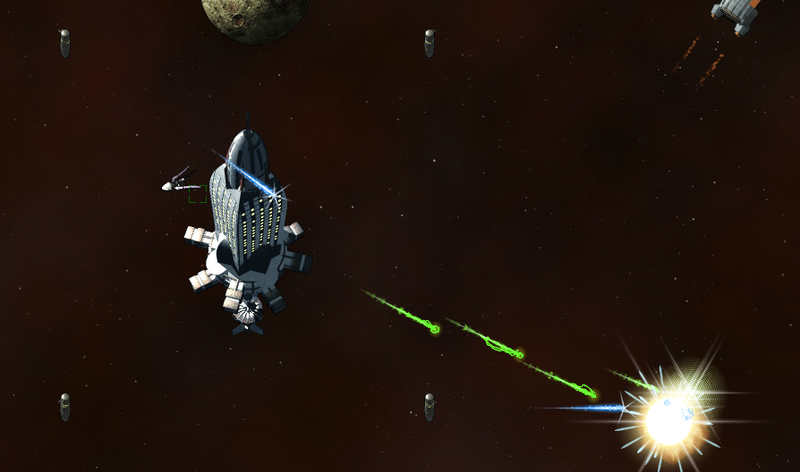 It gains a bonus to rate-of-fire on any installed EI weapon, but cannot fit a missile launcher. I'm still working to balance this one. It cannot upgrade its armor. At all. You're running plasteel for the entire game. 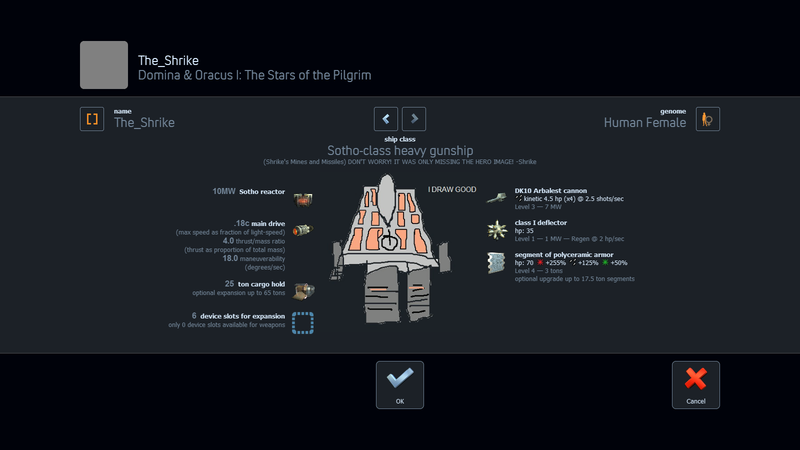 I am considering making this ship have all armor-paste consumables be identified when starting the game. Asterion now has auto-ID of most barrels. I think I need to have some means to improving the armor, but I'm still working it out. The scorpion right now is pretty reasonable, but has a few issues I'll work out in time. I'm currently working on uni stuff, but I should have a patch (including the WIP playerships) out tomorrow before the devstream. The Sotho now has the new images that George added into RC1. It plays pretty well...definitely limited by the low cargo space, but the handling is pretty decent and the auto-omni is great. Typo in the Scorpion fire-control computer description. "signficant" needs an 'i' between 'n' and 'f'. M4 Taurus description has 'maneuvering'. It looks wrong to me but I'm not sure because I can't spell it without a dictionary or Google! And 'varient' might be 'variant' but that could be a cultural difference rather than a typo. I would suggest that the 'weapons that use the launcher slot but aren't launchers' have a separate icon or a group of similar icons in item lists. Its a great idea but I find it difficult to tell which weapon goes where. And great ideas in the playerships too. No launchers allowed. Can't change armor. Excellent. In the Sotho if you are firing the Arbalest and thrusting continuously while the shield is taking hits/regenerating, the reactor will overload and disable the weapon. This could be intentional for balance, otherwise a 12 or 15MW reactor might be the way to go. And I like the way the Drekkar pulverises you with a rainbow! Thanks! Feedback can be hard to get, and this is useful stuff for me to finetune the mod (since with 1.7 out, I'll be doing a rename and non-alpha/beta release soon). I'd also assumed it was cultural, but it looks like I just mislearned it years ago. I'll fix these for the next release. Hopefully I can! I don't currently have any custom icon art, but that's on the "later" list. I might bug Xephyr some time (again). I still feel there's a lot of balance tweaks to be done, but I'm happy with the Sotho at least. The low space, limited weaponry and low speed counterbalances the excellent weapon handling, good armor limits and exceptional starting gear fairly well...at least, I think it does. Certainly I can't do much more on the Asterion and/or Scorpion until the enhancement system gets revised a bit. The sotho also has a crippling weakness to Anton Nasser. I've already got this fixed for the next release. I moved it up to the Nova-10. In the long run I do think I'll add more reactors...but I don't like the way the game mishandles fuel for refuelling right now, so I'm holding off on them. And people said I was mad to try making an endgame foe that used laser weaponry. Started work on some extra munitions to fill in gaps. In particular, I have two shell types for the Auto40 planned for implementation either for the next release, or the one after it.